Get a good scare for the New Year with the highly-anticipated release of Richard LeMay’s supernatural horror BLOOD BOUND out now on Demand. Every 25 years, it begins. Bound to an ancient pact, a family of unlimited power descends upon a small rural town to sacrifice four human lives, one being a member of their own family. This Rosemary’s Baby meets Drag Me to Hell thriller takes a dark look into how far the human spirit can take one soul in it’s most desperate hour. Joseph Melendez (“The Americans”), Eden Brolin (‘’Beyond’’), Rosa Arredondo (“Roswell, New Mexico”), Gerald McCullouch (“C.S.I”), and Cobra Kai’s Vanessa Rubio star in a new film from the director of Dementia 13. 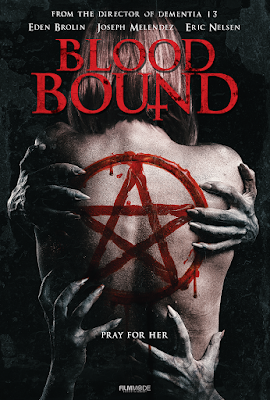 BLOOD BOUND is available now on VOD from Clay Epstein’s Film Mode Entertainment.